Microfiber is made from very fine, soft strands of polyester, a synthetic material. A popular choice in upholstery and furniture, it looks much like suede or leather. Microfiber is considered fairly durable, repelling water and most stains easily. But dry erase markers can still leave their mark: The ink contains both release agents and pigments. While the release agents keep the marker from sticking to dry erase boards and other non-porous materials, when it comes in contact with carpet, clothing or upholstery like your microfiber couch, the color becomes trapped. However, a few household ingredients will remove the ink and leave your couch looking as good as it did before. 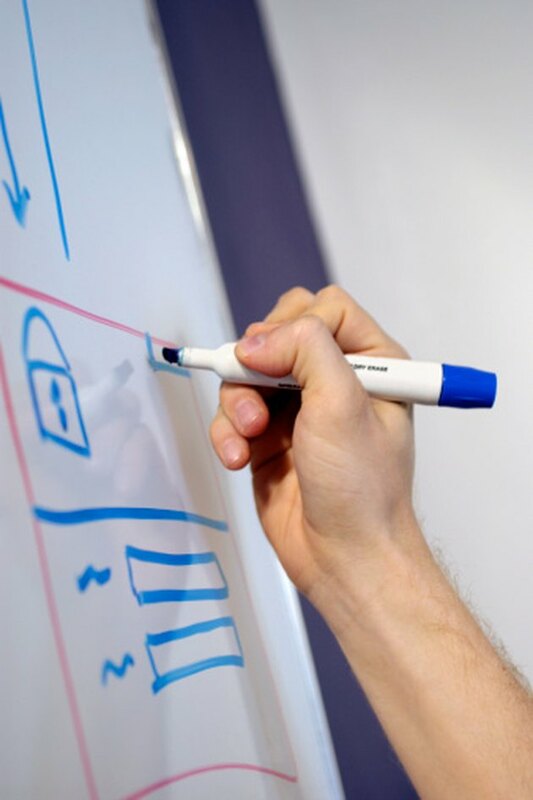 Dry erase markers release easily from hard surfaces, but not from cloth and upholstery. Look at the product label for care instructions. Find the care code on it: "W" indicates water-based cleaning solutions are safe, while "S" means use only solvent-based cleaners. "S-W" shows that either solvents or water are okay, and "X" warns that your couch should only be vacuumed. If you find an "X," consult a professional for best results; using any product could potentially damage the microfiber, so proceed only with caution. Find a hidden area on your microfiber couch where you can test rubbing alcohol on the material. Look for a spot under the seat cushions, on the back or on the a skirt, for instance. Rubbing alcohol is safe for most microfiber, but when improperly applied it might leave a ring. Moisten a cotton swab or cotton ball with rubbing alcohol -- preferably a 99-percent strength version because it dries faster. Use a lesser strength, alternatively, or even a clear liquor such as vodka; the alcohol is the active ingredient which will remove dry erase marker ink, so either will work. Dab gently with the alcohol in your test location. Repeat a few times as if you were lifting ink. You want to apply enough to find out that the alcohol is not spreading too far as you dab and that the alcohol does not discolor the microfiber or leave a ring when it dries. Wait an hour or two after testing to look at your results. If there is no discoloration, proceed to use the alcohol to remove the marker stain. Switch to a soft cloth or use cotton balls -- whatever works best for you depending on the size and extent of the dry erase marker damage. Dampen with the alcohol. Blot the stain, using little to no pressure to make sure you are not actually pushing the stain into the microfiber. Use a circular motion and gentle contact to "scrub" areas that resist removal, relying on repetition rather than force. Change to a clean cloth or cotton ball as needed. Clean small areas at a time if the marker damage is extensive. Allow your microfiber to dry thoroughly -- it may be difficult to really make certain the stain is lifted until it is dry, and the wetness may make you think it is still damaged. Use a hairdryer to dry your couch quickly, especially if you used a low-strength rubbing alcohol; this helps prevent moisture damage rings and splotches.Set the dryer on "low" and hold 8 to 10 inches away from your couch. Use caution to prevent heat damage. Use a toothbrush or other soft-bristled brush to rub the fabric, once it is dry. Rub gently without pressure. This will restore the softness and natural texture to the fabric.